Home › Latest News › The details are in the extras! The details are in the extras! Isn’t it incredible that even though we share one common interest, being the love for the brand and the motorcycles, we’re unique in every little way possible. We might all look slightly similar, but the finesse of each individual Harley® rider lays within the finer, redefined details of who we are. Whether you’re a hard-core daily rider, a commuter, or even just a scenic weekend rider, we all share one thing in common – a deep passion for Harley-Davidson®. With that being said, we fall in love with our Harley-Davidson® motorcycles and also the ride. Whether it’s around the block or cross country we always go the extra mile (pun intended) to enjoy time with our mechanical beauties. This refers to not only comfort, but style too. Adding extras to your ride impact both your styling as well as your comfort during your travels, let’s take riding jackets for example: imagine cruising along the coast on a beautiful day yet you feel a sense that your safety might be on the line. Why not add extras? All Harley-Davidson® riding jackets are equipped with the proper space for extras such as Armour Padding Slots in the shoulders, elbows and back. Having the option to add or remove armour is entirely up to the rider to decide but as all Harley® riders know, extras are key! Caught wearing your favourite Harley-Davidson® riding boots in the rain? Avoid wear and tear by using Harley-Davidson® Rain & Stain Repellent! Picked up a few unexpected extras/ trinkets on your ride? Invest in a swing arm bag for your motorcycle to store your paraphernalia while on your journey(s) if your specific model doesn’t come standard with packing space. As we’ve already established, style is key factor in the Harley-Davidson® lifestyle. Whether you’re kitted up in the newest and improved riding gear or standing out on the road with the latest chrome and accessories, it all comes down to the extras. 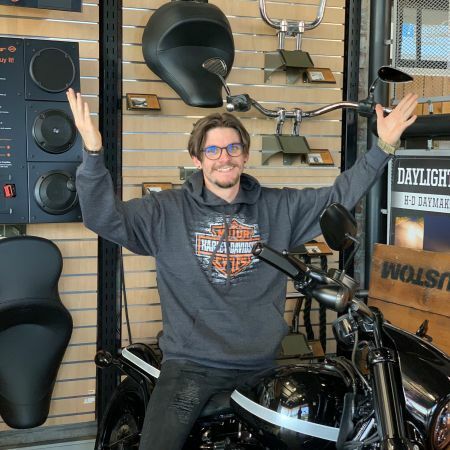 There are endless opportunities here at Harley-Davidson® Tyger Valley to start customizing or to keep customizing your ride and look. Extras don’t necessarily mean minor changes, they can be rather large – how about an alternative exhaust? Adding to your bike's roar is an easy way to stand out of the crowd. And if that isn’t enough, why not add a one-of-a-kind paint job or paint details to your motorcycle? Get creative, get inspired, and get ready. Your customization journey is only at its beginning, so add some Tyger Flair and go ride!